Born on March 6, 1939 – Passed away peaceful on March 30, 2016 at the age of 77, with family by his side. George will be lovingly remembered by his devoted and cherished wife Elisabeth, his hero, Scooter Dog, his children, Kelly Mann, Stephanie (Vincent) Arduini, Victor (Gina) Mann, Jane (John) Derry, Cheryl (John) Gagliano and Terry (Ingrun) Mann, his grandchildren, Brennan (Ming), Connor, Anica (Alex) and Anthony Arduini, Ronald, CJ (Darcy), Korey and Nicholas Mann, Marianna Gagliano, Ashlynn Bousquet, Krystal (Aaron) Webster, and his great grandchildren Kingston Douglas, Emma and Hannah Thiessen and Jack Webster. Brothers-in-law Ted and John Woodrow. He will be dearly missed by many kinfolk in Alabama, as well as, friends and family throughout Canada and the USA. He was predeceased by his mother, father and sister, Willie-Mae, George Lee, and Donna Wright. George’s work career started as a GE appliance repair man in Mobile, Alabama. Soon after moving to Canada he joined the IBEW. He was a proud union member, even checking that his beer was union made. Anyone that was an electrician (or not) was quickly encouraged to sign up as a member. He worked at many job sites throughout Canada and the USA, his favorites were Mica Creek Dam, Revelstoke Dam, and the Tar Sands in Alberta. IBEW was one of his last memories to fade away. George’s Alzheimer disease was confirmed in December 2013 and on December 31, 2014, he moved into Ridgeview Lodge, Kamloops, BC. Our family was blessed beyond words to have such a caring and loving staff spend the last year of his life with him. You are all truly “Caring Angels”. Thank-you from the bottom of our hearts. He loved Y’all! He will live on in the memories of many, especially his sweet sayings, “Everything is Relative” “Tickety Boo” or “Hey Good Lookin’. We will never forget that sweet chuckle, loving smile and famous handlebar moustache that he wore so proudly! George/Dad, you were so brave to endure what you did. You deserve to rest in peace now. We love you and know we will see you again someday. Watch over us now as we have done for you. 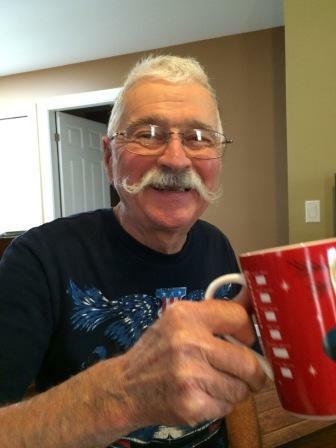 In lieu of flowers, should family or friends desire, donations to the Alzheimer Society of Kamloops, BC or the Recreation Department of Ridgeview Lodge, 920 Desmond St., Kamloops, BC in memory of George Snyder would be greatly appreciated. Memorial service will be held at the Kamloops Community Church, Salvation Army, 344 Poplar St., Kamloops, BC on Saturday, April 9, 2016 at 11:00 am. We are so sorry for your loss. His neighbors in Alabama missed him and Liz when they moved. It was for the best, though, and we knew that. Go rest high on that mountain George. We’ll see you when we get there. GB was a very special man! He was like a brother to Mom and was so much fun to be with!! He always had a smile for you with that great iconic handlebar mustache! He always had a great can do anything personality!! He will be greatly missed!! Love and prayers to all of his family! George and Liz took care of me when I was a child. He always used to call me “jellybean.” He lived a great life and will be missed, but I know he is at peace in Heaven now. I remember meeting George for the first time when he and Larry were in Mica Creek. The mustache and the smile underneath made a lasting impression! He always seemed to me to be such a kind person. Add the southern drawl and who wouldn’t fall for him. You were a lucky lady, Liz. Larry has many fond memories of fishing and hunting trips with George and his Dad. Not sure how much they brought home for the freezer but the good times are what counted. Hopefully he and Johnny are up there together again fishing or hunting for the big one. I will miss George very much, l loved him like a brother. Will see you one of these days.